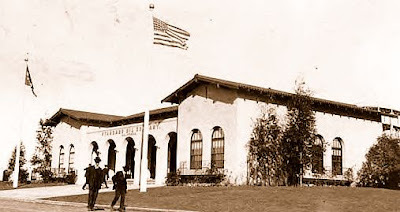 The Standard Oil Company Building was located on the east side of the Panama-California Exposition's Alameda, immediately north of the Nevada State Building. The simple tile-roofed structure was entered through an arched entrance arcade, flanked by pairs of unadorned arched and balconied windows. 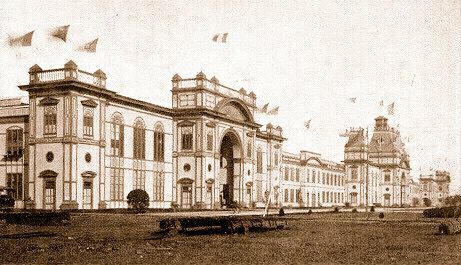 The interior of the building contained extensive exhibits demonstrating the methods by which crude oil was extracted from the ground and refined into various oil products. North of the Standard Oil Company Building was located the exposition's open-air theatre, where agricultural demonstrations and lectures were presented. Adjacent to the open-air theatre, spanning the Alameda, was situated the long and narrow Tractor Exhibit Building and demonstration field.